Tin Description: Captain Earle's Honor Blend is a blend of red virginia, mild cavendish, Turkish and Perique tobaccos. Blended for the connoisseur of seeking an all natural, non latakia blend. Honor Blend comes in a pop-top aluminum tin as a chunk of tobacco – an amalgam of chopped leaf compressed into a cake roughly 2” square by 1¼” thick. It is nestled in a paper cup to provide some protection from shipping and handling. The bouquet is somewhat sour smelling (my tin had 2 years of age on it), but that does not come through during the smoke. Rather, the sweet component of the aroma, deceptively faint in the cake, steps up to the foreground when a bowlful is smoked. 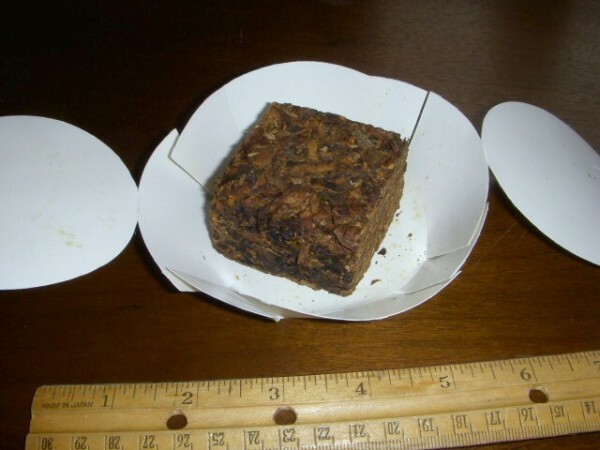 Whereas plug and stacked flake tobaccos have a uniform, orderly appearance, crumble cake more nearly resembles a chunk of particleboard with assorted flecks of chopped leaf oriented in random directions. It is much easier to prepare than either plug or flake. Just rub off as much as you need and suitable pieces readily fall off the cake for effortless packing and lighting. This is a sweet, but not cloying red Virginia that is skillfully enhanced by the other components of the blend. I would call the taste somewhat bread-like, with touches of woodiness and pungency to set off the characteristic sweetness of the red Va. Rather than being sharp and hay-like, it resides more toward the wine-like end of the Va spectrum. Despite the unity of flavor, it is not one dimensional. It possesses sufficient clarity to enable one to taste the Turkish and Perique leaf peeking around the edges of the base tobacco. I cannot say the same for the Cavendish. It must be in there doing its job – but it does not stand out at all. I suspect that the Perique in this blend is not the pure St. James variety, but rather, Acadian Perique – a mix of the St. James Perique and "perique-processed" Kentucky Green River Burley; but that’s not much of a speculative stretch since most of the Perique we will ever encounter is Acadian. In this blend it carries the dark or bottom end flavor very nicely, and with little, if any, of Perique’s notorious peppery pinch. The Perique tingles do make a gentle appearance toward the end of the smoke, but I find it less distracting than the ashy taste that also appears just before the bowl goes out. I think this is a very satisfying, full-bodied smoke with great mouth feel; it produces a great volume of thick, chewy smoke; and it is very smooth. It smokes coolly and dryly; it cannot be coaxed into biting; and there are no lighting and burning issues in this slow burning blend. For me, the only knock on this blend is the room note. Not really awful (to me it is kind of good) – but it is more cigar-like than the War Department would like to smell. If you have enjoyed Anniversary Kake and Marble Kake, you will find Honor Blend to be an uncommon and tasty variant on the theme; and I recommend that you try some.